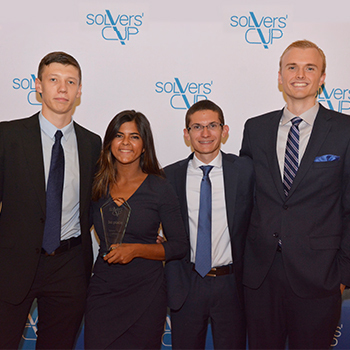 This September, a team of undergraduate students from the Lazaridis School travelled to Budapest, Hungary to participate in the Solvers’ Cup – an international case competition organized by Case Solvers. Thanks to their hard work, passion, and dedication, we are delighted to congratulate Matthew Donovan, Ruslan Nikolaev, Mike Ross and Samantha Sells for winning first place in the competition! The Solvers’ Cup brings together undergraduate students from prestigious business schools from around the world to compete in both a 4-hour and 10-hour case competition. The competition hosted 12 international teams onsite as well as additional teams online for the skill showcase. The Lazaridis team practiced for weeks on their presentation skills under the guidance of Laurier alumni partner Srin Sridharan, partner at Waypoint Investment and Sofy Carayannopoulos, associate professor at the Lazaridis School. Srin, who accompanied the students to Budapest, shared his sentiments. “Solving cases is a great opportunity to work on finding tangible solutions and recommendations for real problems being faced by real companies. It's great to be able to demonstrate to future employers the real experience that solving cases provides.” says Matthew, and he’s right. Participating in case competitions is not only a great way to represent Laurier and build tangible skills, it’s also an amazing way to broaden your professional network and build business relationships that may be helpful when searching for a career after graduation. Again, we would like to congratulate the 2018 Solvers’ Cup winners from the Lazaridis School - Matthew Donovan, Ruslan Nikolaev, Mike Ross and Samantha Sells. Thank you for being wonderful ambassadors on the international stage.